Crawl inside to spin and roll inside this sturdy, well made giant top. A favorite for sensory play! Take it for a spin alone, or pile in with a friend. The top easily gets moving by rocking to one side or the other, similar to being inside a barrel or laundry hamper. Lean to one side to get it moving, and then perform a well-timed series of rocking motions to keep it going. The movements needed are easy to figure out, and help improve coordination and balance skills. We’ve found this toy used by Occupational Therapists to help kids who have trouble with core stability and bilateral coordination. 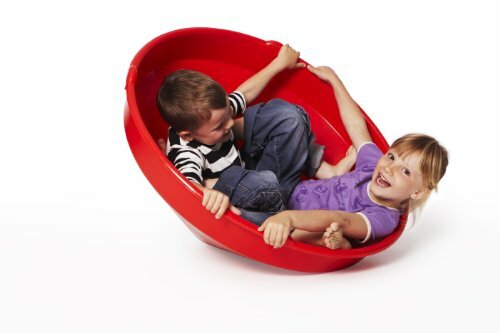 They say the rocking and spinning easily gets kids interested while the conical shape lets kids feel safe and secure once they’ve crawled inside. All in all, a great toy, so long as you’ve got the room to store it. 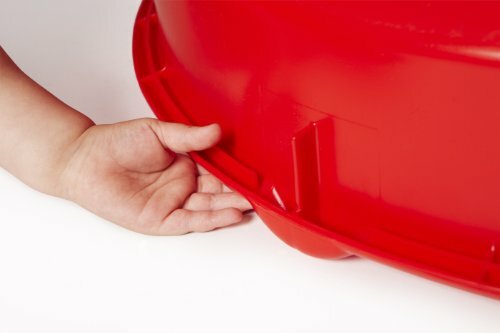 It's not small, so be sure to know where the top will live when not in use before bringing it home. Authorized sellers sold out of the Giant Top on Amazon, so those currently being sold have had massive price increases. We are currently looking for a better retailer. If you intend to purchase this nifty toy, be aware that it should normally cost around $80 plus shipping. It’s a giant top! Made of thick plastic, the conically shaped toy is large enough to fit one or two children with ease. Three children could possibly fit if they are small and very determined. The angled upper edge of the top keeps heads from smacking the ground as spins are made. Be sure to check out the above video to see the top in action. Raised areas along the edge also keep fingers from getting smashed when a child is hiding underneath the top. The top provides a chance for kids to get in some spinning movement while also working their upper bodies. In order to get moving, kids use their arms, shoulders, back, and core to lean their body weight to one side or the other. This will cause the top to roll. In order to keep the motion going, kids must keep moving. This is a seriously cool toy. Since kids have to keep moving to keep the motion going, they have an incentive to keep working. Additionally, because the toy stops as soon as the kid does, the kid is far less likely to become disoriented or overly dizzy like they could with other toys. Unlike toys that allow for continuous and intense spinning motion, the Giant Top lets kids move at their own pace. Who can fit into the toy is more a matter of flexibility than age. We’ve seen grown men who are 6’2” curl up and cradle their one year old child in their lap while a petite 13 year old complained that the toy was too cramped. It was intended for younger children (before the age of puberty), so after that point it becomes more a matter of how compact the rider is willing to get. We have the toy listed as being for ages 3 to 11 years because we think that’s the best age range for children receiving the toy as a gift. While older kids may readily get in and have fun once they see how much their younger siblings enjoy it, we’re pretty sure that most teens would prefer something else for a gift. The plastic is very durable. We saw it hold 220 pounds with no trouble. A thoughtful design helps prevent injury to head and hand. 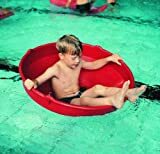 The non-angled portion circling the top’s opening keeps heads from bonking the ground while kids are laying inside the toy. It would require intentional effort to smack their head, and we have had no reports of injury, even when being used by fairly reckless children. Raised semi-circles on the upper edge create a space for hands and feet to be without getting crushed by the top. 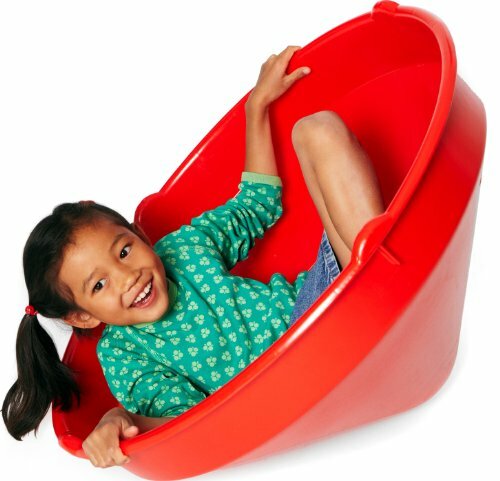 This is particularly useful when kids decide to hide under the top for a little quiet time. Users have expressed very high satisfaction with the top. Its large size entices kids to flip it, roll it, hide under it, and explore different ways to move it before they even get inside. Once there, they can move as little or as much as they want. Rolling in the top can improve upper body strength, core stability, and coordination. 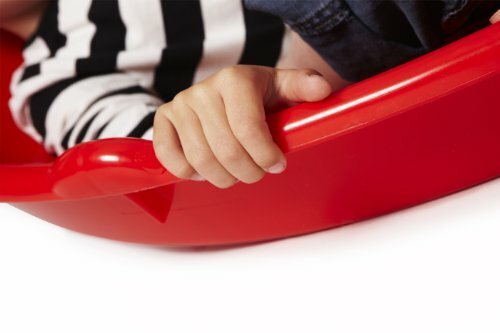 Kids will need to hold on with both hands and push their weight to one side in order to get the toy to move. It may take a little bit of practice to really get the hang of it, but we found that kids pick it up very quickly with no real difficulty. Even the adults found the top to be a fun physical challenge. Storage can be an issue. It’s about as large as a car hood, so storing it outside or in a garage is best. It’s very lightweight, so it can easily be tossed onto other objects. Able to be used as a sled through mud and snow, a few users decided to drill holes into the sides to allow ropes to be attached. Our favorite method of this is to drill holes on the non-angled area at the top, then leave carabiners in the holes. This way, the ropes can be quickly clipped or unclipped, keeping kids from getting tangled in them when rolling around. We’re pretty sure that drilling holes will void any warranty that comes with the toy, so be sure that’s okay before grabbing the power tools. As mentioned above, the toy is very sturdy and we have not found any reports of the toy bending, warping, or cracking. No accessories or attachments are sold. The box it comes in will likely make an awesome box fort. We have no concerns regarding this toy. A wonderful giant top for hours of fun. Top for 1 or 2 children. Lots of uses: use it to rock from side to side, spin it, build a den, etc. Small children can even use it as a boat in the pool (only under adult supervision). Develops children's physical coordination while they play. Made of strong plastic for both indoor and outdoor play. Very suitable for basic physical coordination training with disabled people.